The London Science Museum finally completed work on the Victorian era's greatest supercomputer, the Difference Engine No. 2, 120 years after the death of inventor Charles Babbage. This five-ton machine is currently traveling across the pond to San Francisco, and will go on display in America for the first time starting May 10th at the Computer History Museum. Find out everything you wanted to know about Charles Babbage and his wonderful engines in today's triviagasm. Babbage had a life-threatening fever when he was 8 years old, and the parents ordered that his "brain was not to be taxed too much." Babbage later thought that this left him free to daydream, which led to his computers. Babbage was later schooled at the Holmwood Academy, which only had 30 students. They also had a massive library, with many books focused on mathematics, which he fell in love with. He worked on calculating machine designs from other inventor/mathematicians like Blaise Pascal, Wilhelm Schickard, and Gottfried Leibniz. All of these men had designed working calculators from the 1500s on. In Shickard's case, he had invented a calculating machine called "The Speeding Clock" that could work with six-digit numbers and would ring a bell to indicate memory overflow. It was later destroyed in a fire, but a working replica was constructed in 1960. Babbage himself first proposed building a "calculating engine" with much more capacity in 1822, and he went on to design several machines which he called "Difference Engines." Sadly, they were never built because of their enormous size, cost, and also because Babbage's personality frequently clashed with investors. Also, in 1827, Babbage's father, wife, and two of his sons died... all in the same year. He had a resulting mental breakdown which further delayed any construction or design. The first Difference Engine design had over 25,000 parts, would have been eight feet high, and would have weighed 15 tons. It was never fully completed during his lifetime, although different sections were later assembled and shown to work by his son, Henry Provost Babbage, after he inherited them. Babbage revised his designs for the Difference Engine No. 2, although this was never built during his lifetime either. In 1989, the London Science Museum began constructing one from his designs, and it was completed in 1991. It has 8,000 parts of bronze, cast iron and steel, weighs five tons and measures eleven feet long and seven feet high. Only two versions of this Engine exist: the one built for the London Science Museum, and a second one that was built by the museum on special commission for millionaire Nathan Myhrvold. The first completed Difference Engine No. 2 performed its first calculation in 1991, and returned results to more than 31 digits. That's more than your souped-up pocket calculator. A separate printing unit that Babbage designed was constructed for the Engine in 2000 and didn't need USB a to b cables or a serial interface. Pretty fancy stuff for the 19th Century. 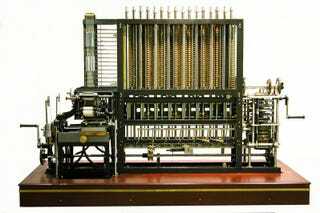 Babbage improved on his Difference Engine ideas again by working on plans for an Analytical Engine that could be reprogrammed by inserting programs on punch cards into the machine. This was the first programmable computer, which later led to other scientists improving on these ideas and eventually to the modern computer. Besides working on engines and calculating machines, Babbage also served as a mathematics professor at Cambridge for many years, won a Gold Medal from the Royal Astronomical Society, working on railroad rail gauges, invented uniform postal rates, ran for Parliament, worked in cryptography, and also invented the "pilot" (better known as a cow-catcher) that was mounted on the front of locomotives to "push" cows off the tracks to help prevent derailings. Babbage also didn't suffer from what he called public nuisance very well, either. He published "Observations of Street Nuisances" in 1864, which was a summary of 165 nuisances that he observed over 80 days. He also wrote "Table of the Relative Frequency of the Causes of Breakage of Plate Glass Windows" after counting the broken windows on a nearby factory. On a side note, growing up in Dallas, Texas, I used to beg my parents to take me to a little software shop to buy computer games. It was called Babbage's. Today it's better known as GameStop, but I still have a soft spot for that geeky little store. To this date, Charles Babbage's brain is preserved in a glass jar at the London Science Museum, just awaiting the perfect moment for reanimation.